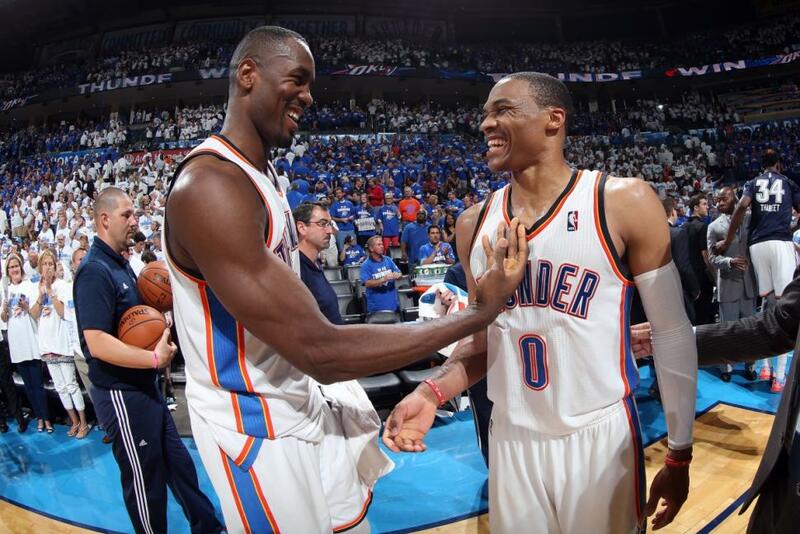 Serge Ibaka (left) and Russell Westbrook have a lot to smile about after the last two games in the Western Conference Finals. The two juggernauts from the dominant Western Conference have been on a crash course for each other all year. San Antonio’s Spurs and Oklahoma City’s Thunder ended the regular season the top two records in the NBA and after navigating the treacherous waters of the West playoffs for two months they managed to give the people a rematch of their uber-entertaining 2012 playoff series. No longer with a Big Three of James Harden, Kevin Durant, and Russell Westbrook, the Thunder still have a better, MVP-version of Durant at this point and after a couple knee surgeries Westbrook has returned to his superlative best with Game 4’s 40-point effort as convincing evidence. But if there was one thing the last two games in OKC have proved to us all is that 3 is indeed the magic number for this team, or maybe its No. 9. As for the Spurs… well, they’re still the Spurs. Their big three of Tim Duncan, Manu Ginobili, and Tony Parker are healthy and still playing well, they played well enough (along with Kawhi Leonard and Danny Green) to put a stranglehold on this series prior to Serge Ibaka’s return in Game 3, winning those first games by 17 and 35 points and the series stands to return to their home arena two more times if it plays out to a Game 7. Still, OKC has looked like such a different team since re-gaining their shot-altering, jump shooting international man of mystery. Could “Willis Reed Jr.” truly be the turning point in this series? As said above, in Game 3 Ibaka’s return was both physically and emotionally uplifting for the Thunder, he proved that he wasn’t going to be a liability in recovering from his once perceived season-ending left calf strain. By playing his usual stellar defense while dropping in 15 points while shooting a remarkable 86% from the field, Ibaka made all the difference in his initial return, and I didn’t even get to his four blocked shots. In Game 4 he continued to show his value to OKC. Though he only contributed 9 points, Ibaka’s defensive presence allowed his teammates to gamble aggressively on the perimeter. The Thunder have 19 steals in the last two games after making 10 in the first two games — call it the “Serge Ibaka effect.” With their supreme rim-protector back and the series even, Ibaka stands as Exhibit A of why the series is back in OKC’s favor. Part of the reason the Spurs got off to such a dominant start in the series is because their role players performed excellently. Danny Green and Kawhi Leonard are the Spurs’ two best perimeter defenders, so anything they provide on offense is usually a bonus. In Game 1 they combined for 32 points while keeping Westbrook and Durant mostly in check. In Game 2 they combined for 25 points while holding KD and Westbrook to a combined 30 points. In these last two games Green and Leonard combined for less than 20 points in each. See the pattern? When Popovich gets excellent offensive play from these two, the Spurs usually win. But since Ibaka’s return it hasn’t been as easy for the Spurs role players to get to the rim. With Tony Parker and Tim Duncan struggling and Manu Ginobili injured, the Spurs need bigger contributions from players like Boris Diaw and Marco Belinelli if they plan to keep up with OKC. The Spurs bench has outplayed most opposing benches this postseason, but now that Ibaka is back and their bench is strengthened, the Thunder seem to have a newfound confidence in each roster position and with OKC’s stars providing their usual excellence the Spurs could be toast without some unexpected contributions. If nobody else is willing, I would simply like to take this time out to apologize to Thunder coach Scott Brooks. Brooks has been on a continuing hot seat because it seems like his young team should have at least one championship by now. The Thunder lack focus at times, and their offense seems so simplistic that it may have been ripped from the NBA 2K video game series, but Brooks has been impressive in the way he has turned this series around. In Game 3 he inserted Reggie Jackson into the starting lineup, and that has changed things as the Spurs now have to deal with yet another extremely athletic player who can get to the basket. Jackson had 15 huge points in his first starting assignment, that took some pressure off of OKC’s stars. Meanwhile, Nick Collison and Thabo Sefolosha have played poorly in this series, so Brooks responded by barely playing them in the last two games. Royce Young of ESPN.com wrote an excellent piece on Brooks earlier this week that made me reconsider the way I think about him — Brooks knows what he is doing and his players love him. Behind some shrewd moves and his usual motivating nature, Brooks has the Thunder on the cusp of a return trip to the NBA Finals, so all I can say is well done Scottie. Well done. I added this point because it would be criminal for me to ignore Russell Westbrook’s amazing Game 4 performance. Westbrook is usually worth an angry rant when takes more shots than Kevin Durant, but in the last thirty years there have only been two players who have had 40 points, 10 assists, 5 rebounds and 5 steals in a playoff game: Michael Jordan and Westbrook, who did just that in Game 4. Westbrook is indeed a special player and at times you just have to let him cook. Westbrook played as if his life depended on it Tuesday, his 40 points came on 50% shooting along with his hitting all 14 of his free throws. What makes OKC so dangerous is you never know when Westbrook is going to have one of these games, he is slowly but surely starting to understand the role he needs to play as the lead guard on this team. Westbrook needs to distribute the ball while also making sure to stay aggressive, with an under control and level-headed Westbrook there is no telling how good OKC can be.